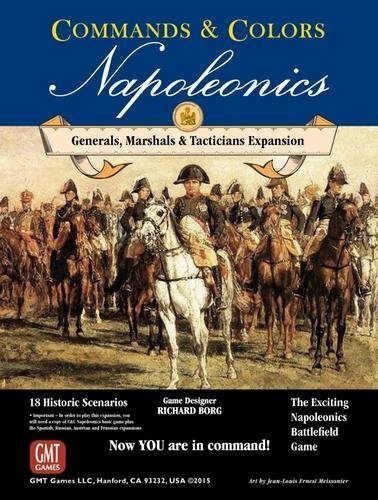 Generals Marshals Tacticians is the fifth expansion for GMT’s Commands & Colors Napoleonics game system. In my opinion, this expansion will impact your Commands & Colors Napoleonic gaming like no other expansion has done to date. In this expansion, there are 18 historical battles. A number of these scenarios focus on the engagements of the French army of 1813 against the Russian, Austrian and Prussian armies around Leipzig. Players will also find a few new units including, Russian Lt Lancer Cavalry and Militia Lancer Cavalry, British Rocket Battery, and French Guard Horse Artillery. But what makes this expansion stand out is the introduction of a deck of Napoleonic Tactician cards. These 50 cards are designed to spice up each and every player’s Napoleonic experience by enhancing the role of leaders on the battlefield, without adding additional complexity or pages of rules. Tactician cards also add an element of suspense and will challenge players to coordinate their use in a timely manner. 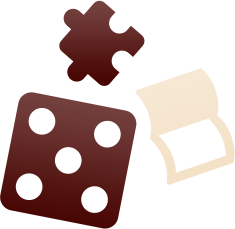 In terms of game play, they represent leader actions and Napoleonic battlefield happenings or unit abilities. These cards may hinder the opposition army, enhance a player’s units or may instantly change the course of a battle. The number of Tactician cards each player will take at the start of a battle is indicated in the scenario notes. For earlier scenarios, players must refer to the Commander Tactician Rating Reference Card, which is a comprehensive listing of all Commands & Colors Napoleonic scenarios released to date with a commander’s tactician rating for each army. The Tactician cards along with the updated deck of Napoleonic Command cards, will add an exciting new command level to all Napoleonic scenarios. The new deck of 90 Command cards has not gone through any major changes. For the most part, players will be very familiar with the Command cards. Updates to the deck mainly focus on how the Command cards work in conjunction with the new deck of Tactician cards. However, the deck does include six new “Take Command” cards. A couple of new game mechanics are also introduced in this expansion including, Garrison Markers, rules for forming and battling with a Grand Battery and an update to the Leader Casualty Check rules, where a leader alone in a hex may now be targeted in ranged combat.